Politician - Votes counts for two. Wins automatically at any point if alive and both the Godfather and Bounty Hunter are dead. The Politician being killed by the Bounty Hunter or Mafia team will trigger the same actions as if they killed each other. In addition, the Politician is Tough. Godfather? Are you referring to Crime Boss? Cops, don't trust your peeks too much in the early game as 3 out of 5 times they'll be wrong. Fok off m8, gl all. You left out one or two players fam. If Mendel dies and he flips to be a townie then at least 2 of the people who voted him are mafia. Statistically speaking that is very unlikely. What are your reads? What Romeo said can be true if there is a competition between two players for lynch. If one of them is mafia then the other mafias will vote the other guy to save their teammate. Blaze was attacked in the night! Blaze was the Naive and Determined Deputy. Also note that now the deputy will have an easier time claiming now that the other deputy is dead, because there won't be anybody challenging his claim and if there is we can sort that out effectively. I have contacted the host regarding my modkill informing him that I have fulfilled the post requirement on the round preceding the modkill. He has initiated an inquiry into the matter and has expressed his apologies for a presumed oversight. This is all a matter of the past now, everybody is prone to mistakes. 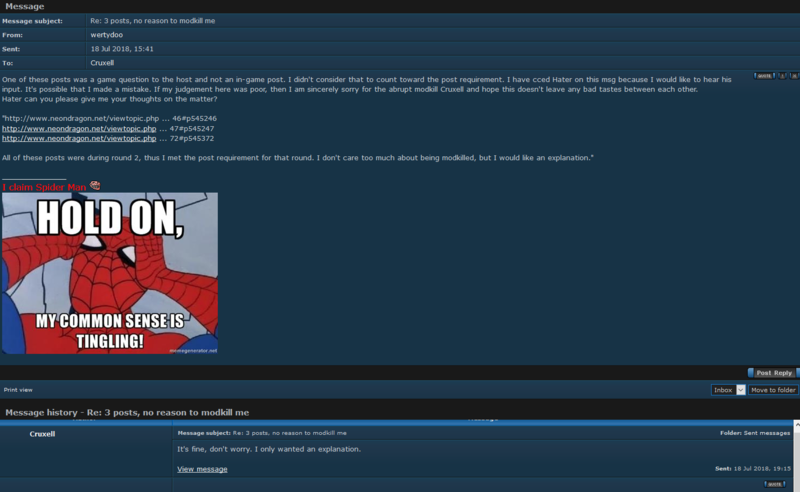 I wanted to clarify the events leading to my modkill publicly in order to prevent being held guilty by the community. I hope that no events of this game will leave a stain on anybody's record and that we all can move on without assigning blame to anybody.